Today, Matt welcomes Kita St. Cyr, a burlesque performer, producer, fire spinner, fire eater, renaissance faire performer, and actor hailing from New York City. A two-time guest on the Crash Chords Podcast (Eps. #45 & #129), Kita chats with Matt about some developments in her life including her recent hiatus from and triumphant return to burlesque. They explore her background and training with fire — and how exactly one becomes a fire eater/spinner/dancer. 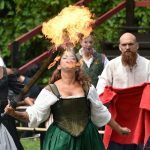 They talk about her new monthly show at The Way Station called The Kita St. Cyr Show; her first summer performing at the Renaissance Fair in Tuxedo, NY; and why she has retired her tiki act. And so, from the importance of self-awareness and growth as a performer to Kita’s love of comic books, here’s presenting Matt Storm and Kita St. Cyr.